Welcome to our spring edition of Dreamtime! March has flown by and we have been working hard behind the scenes to create some fresh material to inspire you. Frontyard landscaping is a little different than landscaping the rest of your yard. This is your opportunity to show everyone your taste, style and show the pride you take in your home. It will also increase the value of your property, and attract more traffic if you ever sell your home. The basic principles of landscape design still apply to front yard landscaping, but the focus will change. 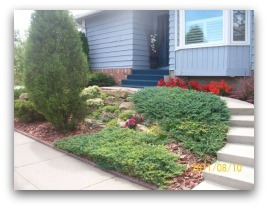 Curb appeal is important in a front, or side yard if you happen to do some corner lot landscaping. This is referred to as the “public” area in landscape design, as it is seen or used by everyone. Your front yard design must also be very practical so it can accommodate anyone that needs to access your house. At the same time, the design should be attractive and welcoming to visitors and people passing by. In this article we will be covering a little bit about designing, followed by some other important tips that can help you with your yard. We hope you enjoy this article and find it helpful with all your do-it-yourself projects. Don't forget that we want to see your projects in our new homeowner picture section so others can gain inspiration from your pictures and story. We also recommend you visit some of our other articles for some great do-it-yourself tips. Landscaping Planning talks about many of the things you should know before you do your own landscaping. It helps you think like an experienced landscaper in the planning stages, so you don't overlook things that can cost you time and money. The old adage, “We don't plan to fail, we fail to plan” is common in landscaping too. For those of you with small hillsides in your front yards, we recommend you also visit our article on landscaping a slope. In this article we talk about the forces of soil, water, and using retaining walls in your design. We also discuss drainage, and the right materials and plants to work with a slope. Landscape designing is a full time career that requires extensive education, so we are just going to cover a few of the basics. These basics will help you as a homeowner to achieve a frontyard design that looks right, and is practical. So what are design principles, and how can they help do-it-yourselfers? Simply put, think of them as a team of fundamentals working together to achieve balance, flow, and unity. They can apply to more that just landscaping, and most people can visually tell the difference between good and bad designs. How many times have you said “It looks nice, but something just isn't quite right?” This is your eye telling you a basic design principles is missing. When you look at something that follows all the principles of design, your response is usually, “Wow!”. This doesn't mean to say that you can't veer outside the box. Like we said in the beginning, it's all about your sense of taste, style, and what themes you may like. After all, it's your house. If no one ever veered outside the box, we wouldn't have the creativity of abstract art. Our goal is to make you aware of what affects your design in negative or positive ways, so you can find the right balance for you. Let's look at some basic principles of design and how they will affect your planning. Depending on the website, or design course you may have been exposed to, you will find that there are different numbers on how many concepts there are. Some may say five, while others may say there are seven. Rather than debate the numbers, it's more important to make sure you understand the most important ones. BALANCE doesn't require a whole lot of explanation. To make it simple, there are three types of balance that you may deal with in your design. The first type of balance is symmetrical and can be described as mirror imaging. You can use your front door as the center line and place the same type, size, and colour of features on each side. Make sure the spacing between features or plants is measured on each side to be equal. Asymmetrical balance differs from symmetrical balance, as the features are not exactly the same on either side of the door. You can use different features or plants, but try to keep things balanced with similar sizes, and shapes. This is a little more difficult to achieve, but can add more interest and still look beautiful. The third type of balance is distal, or near/far balance. This is also referred to as transitional balance. It can best be described by a garden that steps the plants from small to tall. Not only do they show better, but the also provide a nicer transition from one plant to another. Remember that this transitional balance can be challenging, as it changes from every angle in the yard. A flat backyard that backs on to mountains, would be considered a larger scale of distal balance. A good design will lesson the abrupt transition from a flat lawn to high mountains. This could be done by providing some plantings of shrubs and trees at the back of the yard. 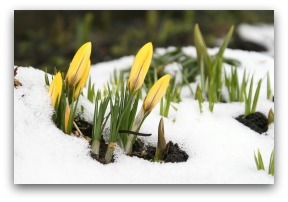 For those of you living in northern climates, you can still have a beautiful yard through the winter months. Winterscaping is becoming very popular in recent years as the long, cold, lifeless winter months last for six to eight months in some climates. Spruce, pine, and evergreen shrubs and trees can provide great balance to your design. Ornamental grasses can give your yard some life, while providing an interesting contrast of colour. PROPORTION is something that most of us already are familiar with. This is when the size of a feature is just too big, or too small for the rest of the features or yard. Building a 4 ft high waterfall in the front of a small flat yard just looks out of place. On the other hand, a 6 ft high tree in the centre of a large back yard doesn't look right either. LINE is usually associated with walkways, garden borders, paths, hedges and other structures. Consistency is important here, as it can create a nice flow in your design. Straight lines are often associate with more formal designs, while flowing curves are more informal. Be careful when mixing straight and curved lines with your structures or features. Very good designers have the ability to provide contrast in an abstract way, but they also must remain practical. Practical means being able to mow and maintain your yard. This means don't leave sharp corners, or strips of grass that are not wide enough for a mower or awkward to maintain. You should always bear in mind the practical side of walking around your yard, and moving required equipment. REPITITION of plants, patterns, shapes, sizes, and colours in your design is very important. When you tie this repetition in with your lines and garden beds, you will compliment the overall flow. A great example of this would be measured interval planting along a walkway or down the side of a driveway. Repetition can also help you with simplicity by not having a complicated, or cluttered design. Keep in mind that too much repetition of one thing leads to a boring yard that lacks interest. This is where understanding asymmetrical balance can help. Try alternating different plants, while keeping the shape or size consistent. COLOUR provides the life of your design. This is what can draw the eye around the yard to different features. When using colour properly with repetition and line, you can control the way your yard is viewed. You can also use colours to draw attention to specific features in the yard. 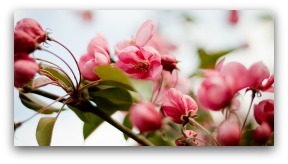 Colour can also add year round interest with pine, spruce and evergreen shrubs and trees. Using seasonal planters with dogwood branches and spruce boughs tied with red ribbons is a great way to winterscape your front yard. One of my favourite winter scenes is looking at red berries peeking through the snow. UNITY we saved for last. By definition, it ties everything together. It is an overall effect of all the elements working together as a team. Smooth transitions between features provide unity and flow. Each individual feature or garden bed will also have it's own unity. The use of groundcovers like decorative rocks and plants, can provide transitions to create a unity. Transition “zones” can best be described as “areas that connect one feature to another”. Decorative rock is one of the most popular transition zone materials. 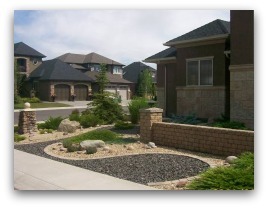 Using decorative rock is ideal for providing attractive buffers alongside the lines in your yard. Many people in northern climates use decorative rock and hearty shrubs to create a buffer between the driveway and the lawn. This is much more practical way to deal with heavy snow, ice, and road salt that can cause winter kill to the grass along the driveway. Along with the design fundamentals, there are many other things to consider in your design. Always remember that the view changes from every angle around your house. You can also frame a view from inside your home looking out. This is done by adding pleasing features you can see from an office, kitchen, or living room window you look out of frequently. Framing a view through a window has the same effect of hanging a three dimensional picture on your wall. Nightscaping can compliment features in your yard in ways the sun just can't match. The elegance and charm of nightscaping gives your yard a whole new look. It also provides safety on driveways and walkways for you and your visitors. How much money and effort is spent putting up Christmas lights for such a short period of time? (Unless of course you just leave them up all year long?) Many of these people have no lighting around their house for the rest of the year. Highlighting features in your yard year round is well worth the effort. Front yard landscaping is all about taking pride in your yard, and proper lighting can help. Make sure you do a little homework on lighting, and include it in your design. A small investment at the start, means years of enjoyment down the road. Lighting is also something that can be done by most do-it-yourselfers. Some trees can provide shade in the summer that cools your home with their dense foliage. When the leaves drop in the winter, they let the sunlight through to warm your house. If your front yard is exposed to lots of wind, trees can also provide you with some protection. Do you want a private entrance, or an open entrance to your home? Effective tree planning can provide you with your needs. If you need year round cover or privacy, use spruce, pine, or evergreen. Where you plant your trees can also be a concern, even with your neighbours. Make sure you understand how the root system could effect property lines, fences, sidewalks, and driveways. These are things we don't consider when we plant them, but could cause damage in the years to come. Don't forget to consider power, or other utilities that the trees may eventually grow up into. Consideration should always be given to what comes from the trees. You may not want apples, berries or pinecones on your driveway or front walkway. Apple trees are nice, but can also invite unwanted visitors. You should also be aware of residue that may fall on your car and stick to the paint. This may sound silly for some people, but talk to your local nursery to find front yard friendly trees. Always consider the size at maturity. We talk about utilities in our how-to modules as something to be careful of when excavating. With this article we want to discuss fire hydrants, street lights, power, and cable boxes on the ground. These are fairly common things in residential areas. so we want to point out ways to deal with them. The first thing is, make sure you know the rules of what you can and can't do around them. Some cities or towns may have by-laws with specific rules of making them accessible. This is up to you to know. Many people will try to hide these eyesores by planting shrubs or other plants around them. Do you remember what we talked about in landscape design? You are going to be drawing the eye to these features in your yard. This means by planting around a power box, you are drawing the eye to the eyesore. Does this make sense? If you can't completely cover or bury it legally, then stay away from it. Draw the eye somewhere else, by creating an area of interest away from the utility. You will find that other people really won't notice it anyway. A partially covered utility of any kind, just looks wrong. We have mentioned the word practical a few times in this article. This means having a yard that is user friendly. Select your materials for their practicality as well as their attractive qualities. Having a walkway made out of decorative rock may be appealing to you, but not practical to shovel or walk on with high heels. Your front walkway should be wide enough for two people to pass each other comfortably. (3 to 4 feet) Use a non-slip consistent surface that snow can be shovelled without catching the edge, or damaging the surface. Dry-laid flagstone may look nice, but might not be practical for a front walkway. If you have a front walkway with a slope, make sure the stairs are safe, practical, and up to construction codes for safety if required. Rise and run refer to the height and tread depth (width) of each step, and sometimes have to meet specific measurements to be legal. Plan your gardening space effectively to the plants you install alongside the walkway. This means consider the mature size of each one, and make sure you have enough room. Make sure you have enough sun to support what you plant directly in front of your house. With new construction, planning for irrigation or lighting in front garden beds is very important. Have any lines installed BEFORE you install your walkway. It is costly, and time consuming having to horizontally drill under a permanent walkway. Remember that the shortest distance between two points is a straight line. Make your front walkway work for you, and also for those that will borrow it. If you don't want people to walk across the grass, don't give them a reason to do it. Not that they should anyway, but your design should be able to control the flow of traffic. Use effective edging to contain rocks, mulch, wood chips, or anything else that may wander around the yard. Whipper snippers and lawn mowers can send these things hurling at destructive speeds. I once took out the side glass of my mini-van when a whipper snipper picked up a small stone from the lawn. Each feature you are considering for your front yard should be well thought out. This can mean making a list of positive and negatives for each one. Some other things to consider are safety, security, practicality and (unfortunately) vandalism. Save your expensive goodies for the privacy of your backyard if you think they might disappear. Use motion detector lights if front yard security might be an issue in your area. Designing and building your own yard can be fun, and rewarding. Make sure you visit our how-to modules for some more information on installing your own projects. There are also many great tips throughout our website. You can also visit our landscaping ideas photo gallery for ideas and inspiration. We hope you enjoyed this article and pass it on to others that may find it helpful. New material is added to Dream-yard on a regular basis. We have some great new material coming out in the next week or two. A continuation of our estimating series, we will take you on a trip to a soil supplier. On this trip we'll walk you through the yard explaining what soil is, why it is so important for the success of your landscaping project and how to properly estimate it for your project. We also have our newest How-to module that will be released. From weeds, pests and compaction to sterile soil and neglect, we cover lawn problems. How to diagnose them, decide if it is a simple fix or a major renovation that is needed to get your lawn looking its best, this year and for years to come.